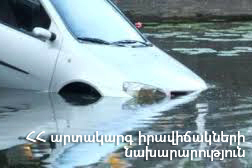 On April 11, at 17:36 an emergency call was received to “911” service that a car accident had occurred near cheese factory in Chambarak town, Gegharkunik province: a car had fallen into the river, there was a casualty. It turned out that “VAZ-2107” car (driver T. T. born in 1978) had run off the roadway and appeared in the river. The driver had come out of the car by himself. The rescuers took the car out of the river and moved the driver to the ambulance. T. T. refused hospitalization.